Under Armour posts stronger-than-expected fourth quarter earnings, and confirms its 2019 profit outlook, sending shares higher. Under Armour (UAA - Get Report) posted stronger-than-expected fourth quarter earnings Tuesday, and confirmed its 2019 profit outlook, sending shares higher. Under Armour said earnings for the three months ending in December came in at 9 cents per share, well ahead of the Street consensus of 3 cents and up from flat profits over the same period last year. Group revenues, Under Armour said, rose 1.5% $1.4 billion but again topped the consensus estimate of $1.21 billion. 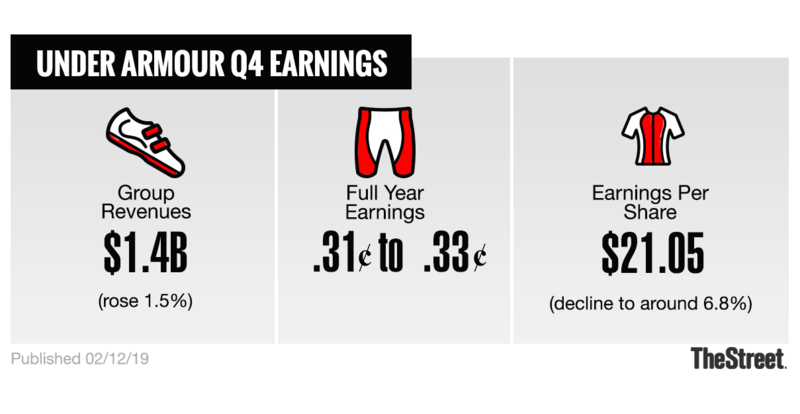 Under Armour also affirmed its recent 2019 outlook, which sees full year earnings in the range of 31 to 33 cents per share and revenue growth in the region of 3% to 4%. "Our 2018 results demonstrate significant progress against our multi-year transformation toward becoming an even stronger brand and more operationally excellent company," said CEO Kevin Plank. "As we look ahead to 2019, our accelerated innovation agenda, disciplined go-to-market process and powerful consumer-centric approach gives us increasingly greater confidence in our ability to deliver for Under Armour athletes, customers and shareholders." Under Armour shares closed up 6.9% to $22.12 on Tuesday.